Box Text: BUILD. DISCOVER. DOMINATE. INSPIRE. Lead your civilization from the dawn of man to the space age and beyond, in an all-new Civilization created exclusively for console. Go head to head with history’s greatest leaders as you wage war, conduct diplomacy, discover new technologies and build the most powerful empire the world has ever known. • Choose your leader and defeat your rivals. Admire your accomplishments in the Hall of Glory. 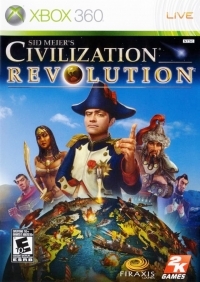 • The best Civ multiplayer ever! Featuring ranked games, leaderboards and exclusive downloads. 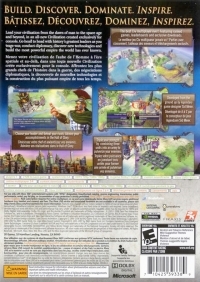 • Developed from the ground up by legendary game designer Sid Meier. • Triple your strength by combing three units into an army to pulverize your enemies. This is a list of VGCollect users who have Sid Meier's Civilization: Revolution [CA] in their Collection. This is a list of VGCollect users who have Sid Meier's Civilization: Revolution [CA] in their Sell List. This is a list of VGCollect users who have Sid Meier's Civilization: Revolution [CA] in their Wish List.